Like most people, you will probably have multiple e-mail contacts. 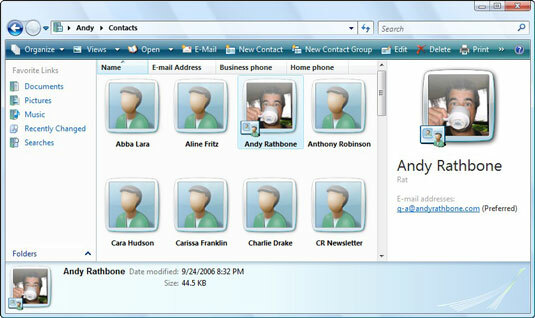 Windows Vista uses the Contacts folder to help you manage your e-mail contacts. (Windows XP used the Address Book.) The following figure shows the Contacts folder. Keep track of your friends with the Contacts folder. Let Windows Mail do it automatically. When you respond to an e-mail, Windows Mail automatically tosses that person’s name and e-mail address into your Contacts folder. If Windows Mail ever stops doing that, fix it: Choose Options from the Tools menu, click the Send tab, and select the Automatically Put People I Reply to in My Contacts List check box. Add Contacts Manually. When somebody hands you a business card, you must enter the information by hand. From inside Windows Mail, choose New from the File menu and choose Contact. Simply add the person’s name and e-mail address, or create a detailed dossier by filling out every box on every tab. Click OK when you’re through.